When looking through Mrs. P's Potions website, I was immediately drawn to her thermals! She has so many to choose from so it took me a while to decide which one's I was interested in trying out. I ended up picking Pint-sized Peanut & Pretty In Peony. Pint-Sized Peanut ($11 CDN) is a thermal nail polish, which means it changes colours with your body temperature. It starts off as an ultramarine blue (my fingers weren't that cold, so it looks almost purple in my photos), and when it warms up, it turns to a light pink. The polish itself has a pearl finish and was on the thin side. It took me 4 coats to achieve the opacity in my photos. 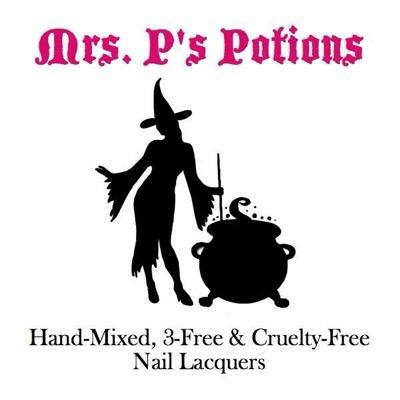 This polish also has a beautiful meaning behind it, so please check out the polish on Mrs. P`s Potions website and read all about it: click here. Pretty in Peony ($11 CDN) is another thermal polish that changes colours with your body temperature (I couldn't get my fingers cold enough so I had to stick my hand under cold water to see the change - hence the wet fingers! haha). It starts off as a rosey pink (when cold), and gradually gets lighter to a pale pink (when hot). I'm actually wearing this polish as I type this and my nails are almost white! My fingers must be on fire as I type this ;) haha. I forgot to mention the best part about this polish - it's holographic!! In the sunlight, it's SO beautiful.. sadly I couldn't get a good shot :( It took me 3 coats to achieve this opacity. What do you guys think about this polish? Head over to Mrs. P's Potions to grab these beauties!